COPYRIGHT TLC TALK SHOP - Blog design by Blog Queens. Powered by Blogger. As we all know, personal relationships are important and add quality to our life. While we have the family we are born into, friends become the family that we choose for ourselves. Friends add a HUGE amount of quality to our life. A couple of years ago, one of my students with autism was having a hard time identifying, making, and keeping potential friends. He ate alone. He played alone. He kept to himself. When another student showed the slightest interest, he jumped on it because he wanted friends. The problem was that typically the students that showed an interest were not potentially good friends. They sometimes talked down to him or made fun of him. Other times he would get into trouble because 'a friend' suggested that he pull the prank but would not tell who these 'friends' were because he wanted them to remain friends with him. We had to not only teach him how to make friends but we needed to teach him 'what a friend' truly was. Let's be super real a moment. It is not just our students with autism that have difficulty navigating friendships. My daughter is in 3rd grade this year and she is also demonstrating difficulty (along with the kids in her class). 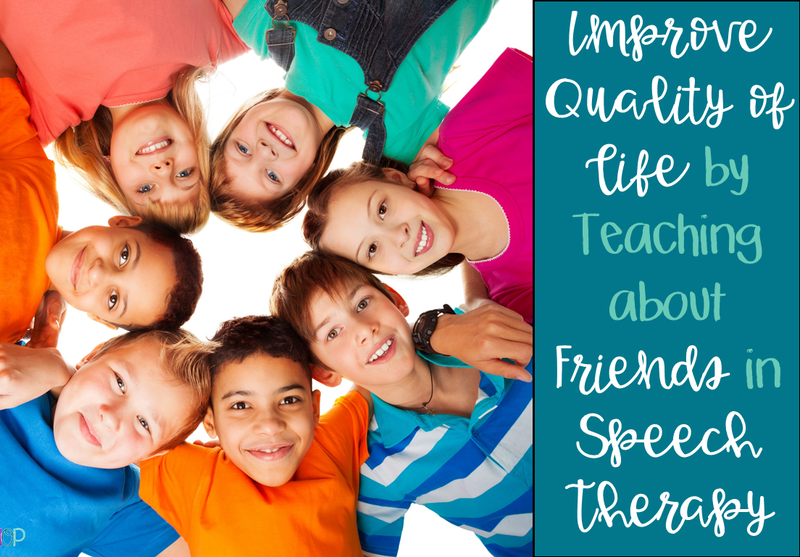 How can we teach the skill of determining who is or isn't a potential friend? USE SOCIAL NARRATIVES: Although general social narratives to teach a skill can work wonders, the more personal you can make the narrative the better. It is easier for our students to relate to it and later generalize and apply the skill. If you are not great at writing social narratives, you can find generalized social narratives about friends and then just be sure to connect it to a similar situation that the student experienced. You can find a social narrative with connected activities that I wrote about this subject, here. 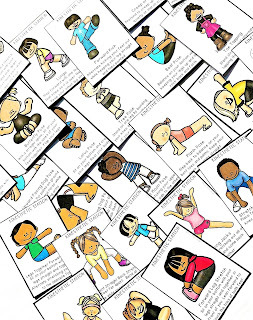 Social Narrative & Activities Set: Are they Friends? ANALYZE SOCIAL SITUATIONS: In some social situations, we do not need to analyze the facial cues, body language, and tone of voice as much as we need to analyze the situation and how someone may feel about the situation. Teaching perspective and empathy can be very difficult skills to learn. Many of us think more about what we feel or how we perceive things and need to take a step back to analyze the situation and that there are two stories to every situation whether you are a person with autism or not! That is why I have found analyzing social situations and then drilling similar situations and expected responses is beneficial to helping our students identify, make, and maintain friendships. This especially goes for making and maintaining friendships. If a student was to respond in a non-typical manner, it could make it harder to establish or maintain a valued friend that could ultimately improve the quality of their life. PULL OUT YOUR THEATRICAL SIDE: Yep, I mean it. Role play different social situations with them. We often teach our students with autism to look at facial cues, body language, and hopefully tone of voice (sarcasm is starting younger and younger these days!). Teaching body language and facial cues are easy, we typically pull out pictures and analyze them. Teach our students to look at the eye brows, the mouth, the eyes.. etc... I find that many of my students catch on in the picture but then they struggle to generalize the skill in real life situations. To help remedy that, I role play a lot so they can see it in real time. I also point things out when we are engaging in conversation and ask them to read my cues at that moment. SOMETIMES A RULE IS NEEDED: I know we spend so much time trying to teach our students with autism to be more flexible in thinking and here I am suggesting sometimes we need to teach a rule. I say this because it is sometimes true. For example, in the case of my student that got in trouble because he was asked to pull 'pranks' that repeatedly got him in trouble, I had to teach him that when a 'friend' suggests he pull a prank that they think would be funny, he needed to politely say no. Not just decline the suggestion, but even learn to flip it back onto these 'friends'. If they thought it would be so funny, then they should do it. If they didn't follow through with the 'prank' then that was one way to know that it was never going to be funny and that it was meant to get him in trouble. OBSERVE the ENVIRONMENT: Before they can use these skills out on the playground or in the cafeteria, they need experience to repeat the opportunity in real life situations. This is where I get family involved. For this particular student, I sent home family homework that included making collages from magazines, analyzing interactions between characters during favorite tv shows, etc.. I have also visited students during recess. If they are not engaging with play with others, I watch to see if there is a group of students that they seem particularly interested in interacting with. If so, we take a moment to observe the other kids and talk about what they are doing with their bodies, faces, and tone to decide if they are playing with each other nicely and if they may be receptive to another person joining in to play. How do you teach your students to determine who is really being their friend and who is taking advantage or not being a friend? I would love to hear your ideas! Share what you do in your speech room in the comments below. 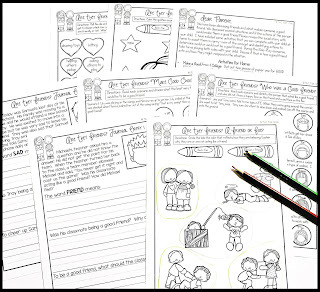 If you do not want to create your own packet to address this skill,I have created one that includes a social narrative, social situations to analyze, family homework, etc.. You can grab it here. Want more great tips, tricks, and ideas for successful speech therapy? Subscribe to our FREE newsletter, or visit us on Instagram, Pinterest, or Facebook. Let's be real for a moment. If you look at the BIG companies that sell us resources to target speech and language skills, you won't find much geared towards our secondary age students. In fact, recently I compiled a list of speech and language games that are commercially out there to target a variety of speech and language skills and something I was shocked to find was that when the company marked the ages it was appropriate for, it would start with something like "2nd grade and Up". Okay, up to what age? I know that resource wouldn't engage my 9-year-old, let alone a middle school student! So how do we keep them engaged?! I once had a group of girls working on articulation and all they wanted to talk about was their favorite boy band and all about the boys in it! So, I let them bring in teen magazines. We searched for words that had their sounds and made a list. If they were at the drilling level, they still had to drill those words but then could tell me something about the band. If they were at the carryover level, we just had conversations about the group. Another student was really into theater and so he brought in old playbills for performances he had watched and/or participated in. When he was chosen to be in the school performance, he brought in different directions for scenes and his lines. He was working on using his fluency shaping strategies and desensitization. If you let them bring in the materials, it is a win-win! 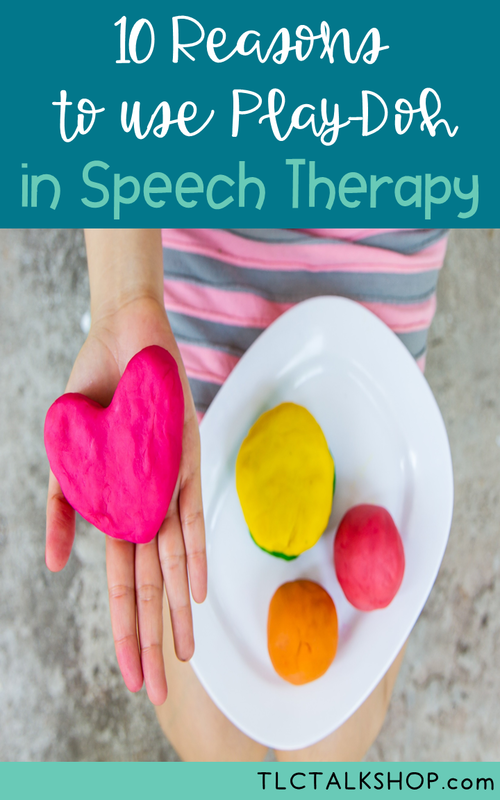 You do not need to plan so much and search like crazy for engaging materials and they are more than happy to participate in speech therapy. Just be sure to have some sort of back up plan, because sometimes they do forget. I always have a pad of paper beside me because when all else fails- simply talk. Yep, just have a conversation with them about their interests and you can jot down words to target articulation, language, and fluency! Although a lot of the apps made for speech and language skills are created for our little friends in mind, there are a few really good apps such as Newsela and Conversation Builder. Truthfully, I use my tablet to access Newsela online and appropriate Youtube videos (so check them out beforehand). Sarah Wu, a bilingual SLP, has a great youtube channel. She has a series of wordless life skill videos where she cooks up a lot of yummy treats. She has also compiled a playlist from other youtube sites that have wordless videos to teach problem-solving. Check her channel out and subscribe. With a little digging on youtube, you can find a lot of great resources to engage our middle school students and get them talking and practicing their speech and language skills! For my fluency students, I have spent time checking out the National Stuttering Association and the Stuttering Foundation websites with them so that they were aware that these sites exist and where they can find additional support. We have even talked about favorite celebrities and looked them up on Wikipedia. Yep, that is right. I am not ashamed to admit it. I do always inform the students beforehand that all of the information on the site may not be accurate but it at least gives us a starting place. Some of our students have busy after school lives or parents that have super busy lives which makes it difficult for completing all of their work. They may have a presentation that they are working on or reading multiple chapters and completing an outline or answering questions. You can help them! You can target specific sounds, help them break down the language to better understand the materials, and/or have them practice their presentation using their best speech sounds and/or fluency shaping techniques. Sometimes, being just an additional adult that wants to help and see them succeed encourages them to come to speech since it makes them feel special. I have even let them bring in their math books too! Math becomes more complex when they have to follow multiple steps to complete a problem and teaching them about the context clues written into those problems, helps them understand the steps that they need to take to come up with the correct answer. I have brought in local menus and sales advertisements. We have had some great discussions about why something would be a good purchase, what dream purchases they would make and why, and what restaurants they would like to try or have tried and did not like. I was shocked to learn that some of my students had very strong opinions about places in the community! It was great to see some of their eyes light up when we talked about some of the new video games in the flyer or other items they were interested in. Hint: the electronics section and the self-care (skin care and make-up) sections were always the big hits in the sales advertisements. 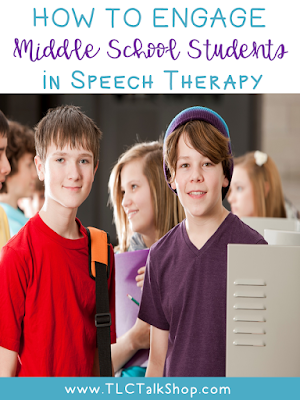 For additional ideas, check out this post on using literature for Middle School Speech Therapy. 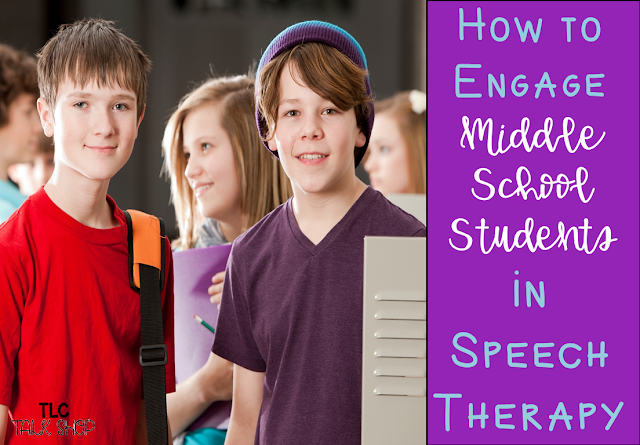 How do you keep your middle school students engaged? Please share your ideas in the comments below. Use a Modified 5-7 Minute Articulation Speech Model: If you have an iPad this has become so much easier! If you have any articulation app or some of the great No Print Articulation resources found on Teachers Pay Teachers, you can simply go class to class daily, set a timer on your iPad, and collect data for each student that would benefit from the brief daily intervention. In the early days, prior to having my iPad, I had huge notebooks full or articulation pages and would go room to room with my pull cart. If you don't have an iPad, using a cart and your favorite articulation pages still works well. I found that this model worked for students working at all levels of articulation with the exception of isolation level. When students were working at the spontaneous speech level, I showed a picture for narration or just maintained a conversation with them during the 5-7 minutes. Use a Centers (Stations) Model: Do your school sites have Fun Friday? I found that incorporating Centers Therapy on Fridays maintained students' participation and continued the "fun friday" feel. I cycle the students through four different centers typically in groups of two with students remaining in each center for roughly 5 minutes. 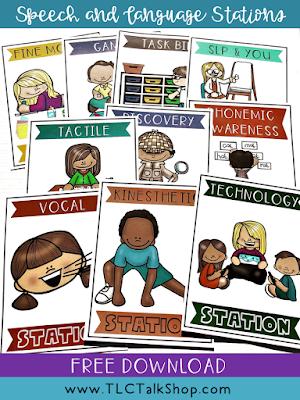 I found this made it easier to keep students engaged in therapy, practicing their speech sounds, learning monitoring skills, using movement to help with learning, and providing opportunities for me to easily obtain data with each session and provide additional reinforcements as needed. 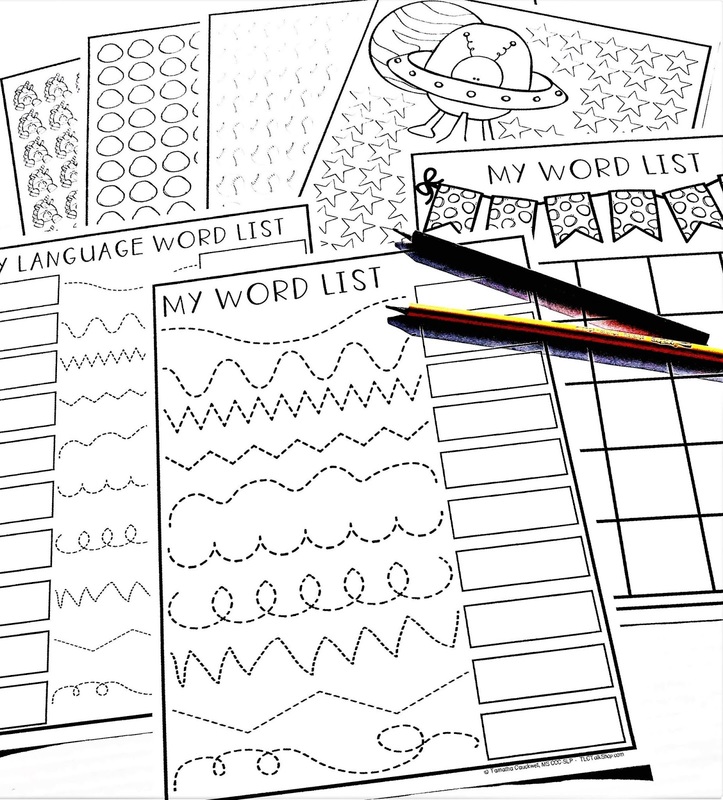 I typically use centers that include the following modalities: writing, tactile, voice, and movement. Check out this post to learn more about using Speech and Language Stations. Use a 3:1 Flexible Service Model: I have gone to several trainings about this model but truthfully, I have never incorporated into my own speech schedule. 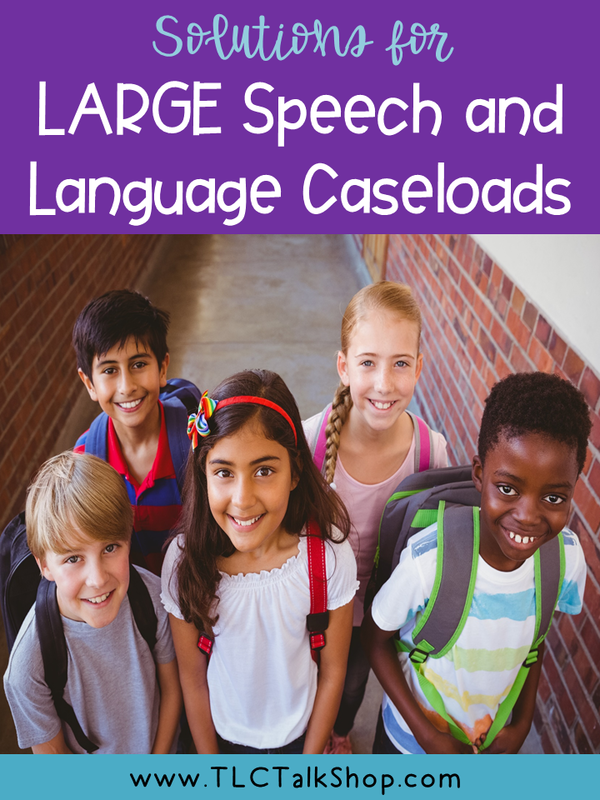 Not all districts support this model and if you have not had training to incorporate it appropriately, you may make more work for yourself and leave yourself open for legal issues since you would need to figure out the math for the IEP. 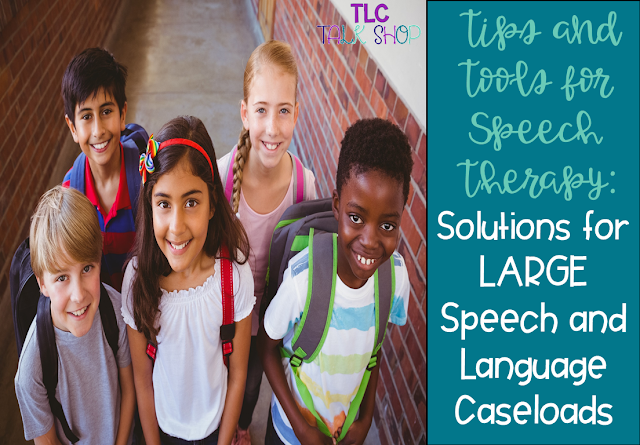 With the 3:1 model, the SLP sees the students' for three weeks and have one week for collaboration with other specialists and the general education teachers, consultation, assessments, etc... You can learn more about the 3:1 model from Speech Room News and Word of Mouth. Embrace Mixed Groups: Sometimes scheduling leaves us with limited flexibility and we often have mixed groups working on a wide variety of skills. Embrace these groups! 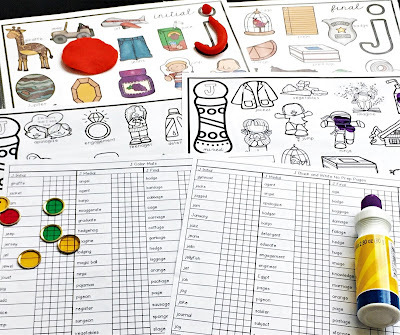 I found that the easiest way to work with these groups were to incorporate open-ended games, craft activities, literature, and materials made for mixed groups. If you solved this situation in another way, I would love to hear about it in the comments! 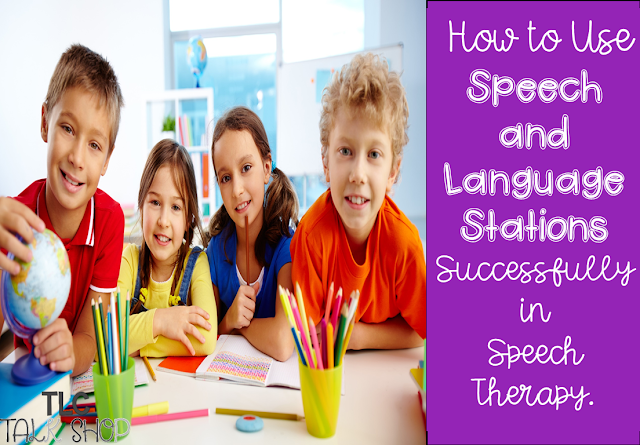 The use of centers is not a new idea and it is completely easy to incorporate into your speech schedule! Using a centers approach is an easy way for students to successfully practice their speech and language skills while staying motivated and practicing additional skill sets (your Occupational Therapist will love you)! The centers model also allows you a chance to collect data from each student and an opportunity to make the most of every minute! You may have heard mention of using this model especially when working with articulation students but you do not have to limit yourself to just students working on articulation skills. This model can also be used with students working on goals for apraxia, fluency, language, and phonology too! That is why this model is incredibly helpful when working with large caseloads, mixed groups, and/or students that have a lot of service delivery time. With six students or less you are guaranteed at least 5 minutes with each individual student to review their work, collect data, or progress monitor. You do not want to spread the students out to much. I like to have two kids working at two stations, one student at another station, and one working with me. For example, I might have two students at the Discovery Station, two students at the Vocal Station, one student at the Kinesthetic Station, and one student with me so that I can collect data. If I am working with a smaller group, I will reduce the number of stations and have the students at the stations for a little longer. I use a timer and teach the students that when the timer goes off they are to move to the next station. When I am working with a larger group of five or six students, I set the timer for 5 minute intervals. However, if I am working with three or four students, I set the timer for 7-10 minute intervals. Think outside the box when creating different activities to use at each station and remember sometimes an activity could fit in more than one station. 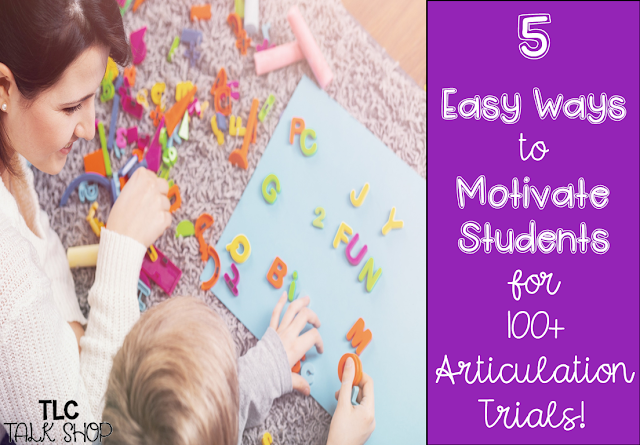 Practically any task you create for articulation can be tweaked for students working on other areas of need. 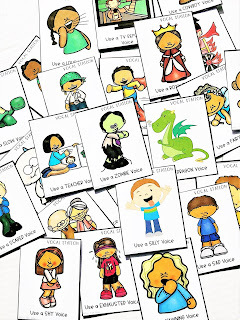 For example, if you pair a list of articulation words with vocal station cards, students working on language skills can use those same articulation words but using them in grammatically correct sentences, providing a definition or a description for the word, or stating a function, category, antonym, or synonym for that word. Students working fluency, can work on using those same articulation words to practice using fluency shaping techniques at their level (word, phrase, sentence) or you can add a little recorder so they can record themselves using the word in a sentence and then listening back to determine if they were correct in stating if their speech is bumpy or smooth. 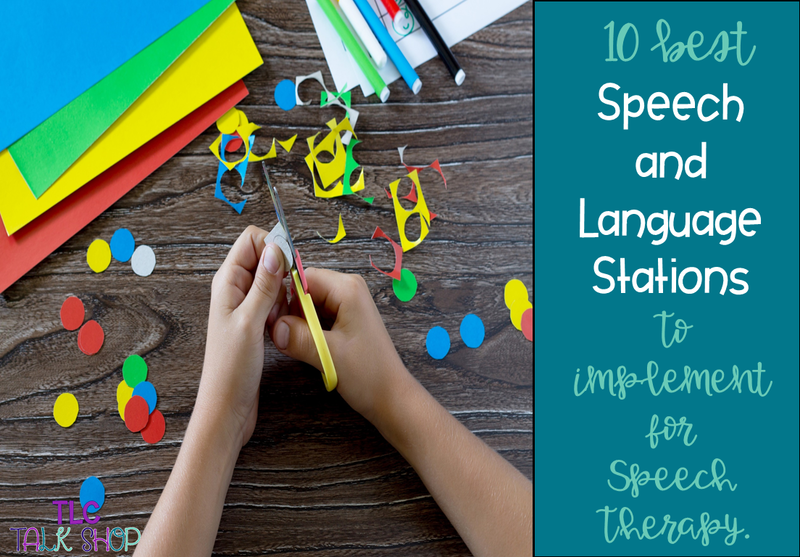 Check out this blog post if you are interested in learning the 10 Best Speech and Language Stations and an exclusive freebie including Station Posters, Vocal Station Cards, Kinesthetic Station Cards, and more! 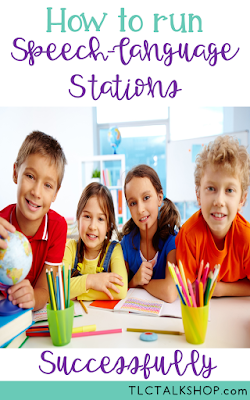 Do you want to implement the use of Speech and Language Stations but are not sure what stations to include? 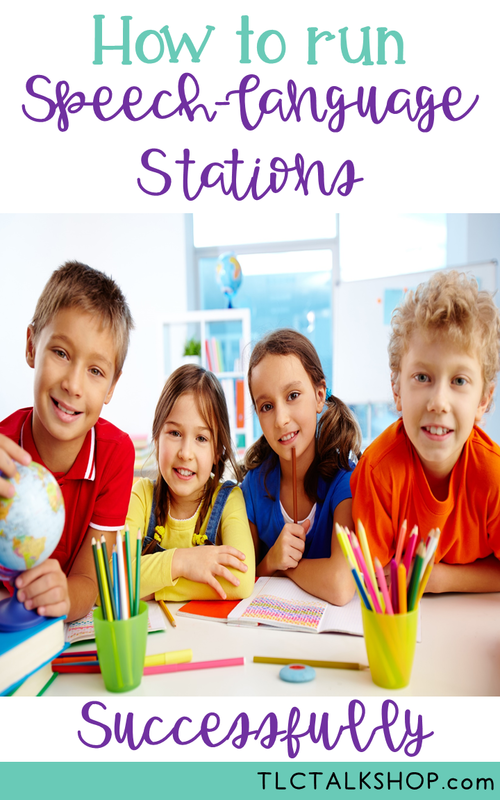 Here are the stations that I have found most useful and some suggestions of activities that you can include in each station. 1. VOCAL STATION- Using a variety of voices (i.e. slow, loud, silly, dragon, etc..) students practice using their best speech sounds at their level, language skills, fluency shaping techniques, and/or vocally expressing minimal pair contrasts. 3. TACTILE STATION- At this station, students can engage with sensory bins, playdough mats, or you can use a cookie sheet covered in sand, whip cream, or shaving gel or cream. When I have incorporated the use of the cookie sheet with sand or shaving cream, I have had articulation students write the letter representation for the sound they are working on or their articulation words while they practice. I have had language and fluency kids also draw pictures or write sentences in it and then describe what they drew or practice the sentence that they wrote. 4. FINE MOTOR STATION- Students can use daubers, crayons, or colored pencils while working with 100 count sheets. This is also a wonderful station for working on tracing, cutting, and writing while practicing their skills. I have also used puzzles and had students string beads or work on lacing cards while practicing their speech and language skills out loud. 5. 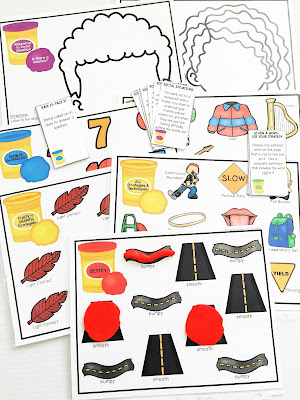 PHONEMIC AWARENESS STATION- Students can work on clapping out their words to determine how many syllables are in their word. 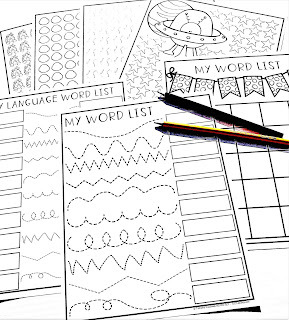 Other ideas include having students use sorting cards to mark the placement of their sound in the word, how many syllables the word has, and if their words rhyme or do not rhyme. You could also have students try to come up with a rhyming word to pair with their articulation word. 6. TECHNOLOGY STATION- Do you have a tablet with articulation and language apps on it, internet access, or no print resources in a notebook app or ibooks? Or perhaps your school is a chrome book or tablet school and students can access the internet. Students can work on any of those resources using a tablet, chrome book, or a computer. 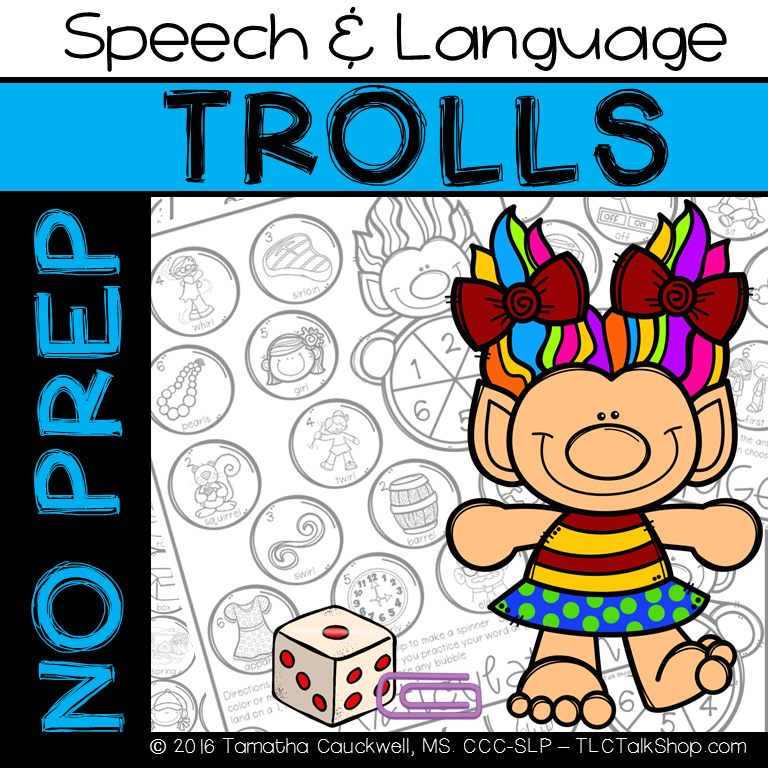 You can find some great speech and language games on Quia. 7. DISCOVERY STATION- In the discovery station, I have borrowed science kits from colleagues and had students use magnifying glasses with my Find Articulation and Follow Directions series of resources. 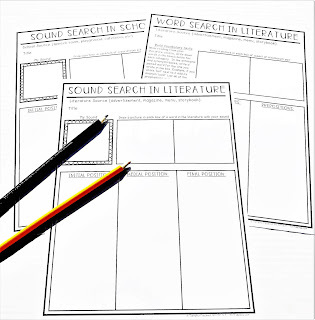 I have also had students go on a speech sound search using a variety of literary mediums (advertisements, magazines, story books, menus) or while using creative visualization for different areas in the school. 8. GAMES STATION- Students work in pairs at this station. They practice their speech and language skills while taking turns during a game. You can incorporate board games, open-ended games, or any of the great speech and language games you can find on TeacherspayTeachers. 9. TASK BIN STATION- So often a resource can be used in more than one station. 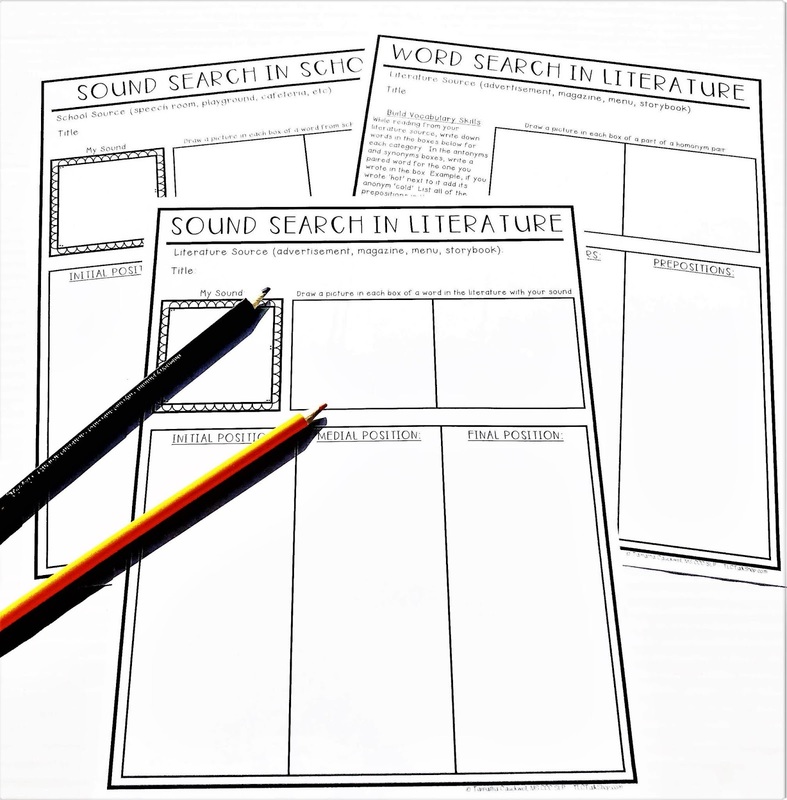 I use this station when there are two activities that I want the students to engage in but only one poster so I need to create another quick station to use a similar resource. This station could also be considered the independent work or task card station. 10. KINESTHETIC STATION (aka MOVEMENT STATION)- Students get out of their seats and move around for this station. Ideas for this station include using Kinesthetic Station Cards for students to practice different exercises while practicing their speech and language skills out loud, use Twisted Speech and Language resources, bowling by rolling a ball to knock down cups (or plastic pins) that have their words under them, or you can create mini obstacle courses using hula hoops and little orange cones. Do you use stations in speech therapy? As you can see, they do not have to ONLY be for articulation. You can use the same themes and tweak them slightly to accommodate a variety of needs! 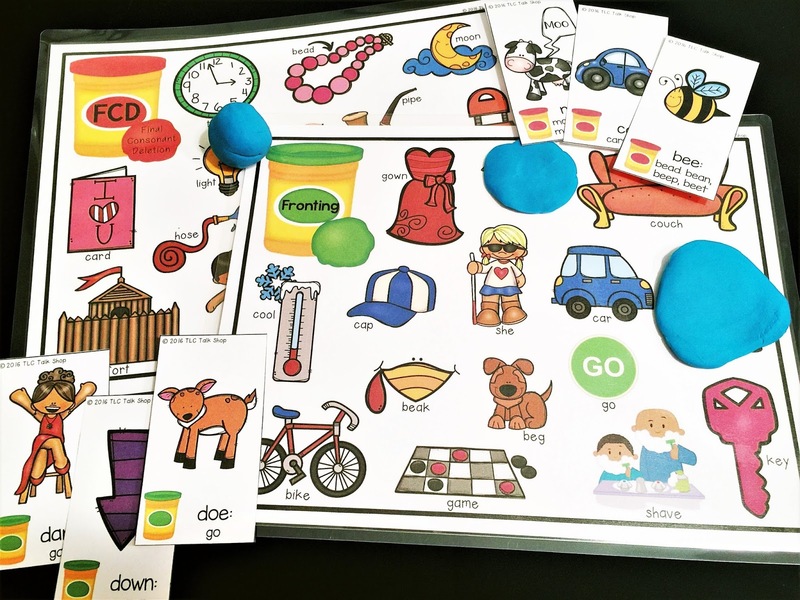 If you are interested in giving it a try or simply do not want to recreate the wheel, you can get my Speech and Language Stations pack as an exclusive freebie as a friend on my email list! Yes, please! 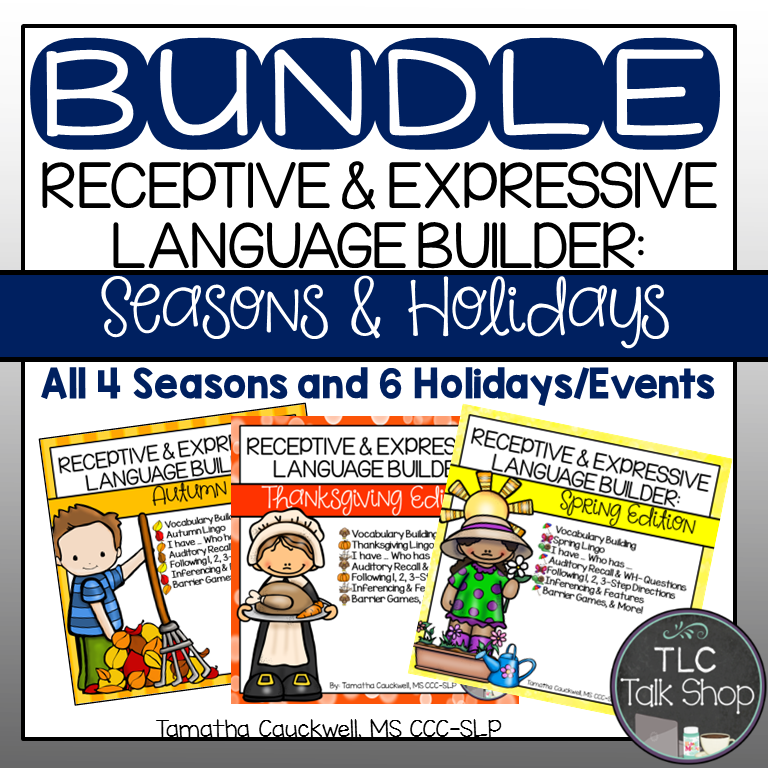 Send me the Speech and Language Stations Starter Set! I don't know about you but I know that I am often told 'I wish I could just play with kids all day with games and Play-doh'. Are you? When I have explained that Play-doh and games are just tools to keep student's engaged, I have been met with skepticism. Next time someone asks you how Play-doh helps student's to meet their goals, you can take your pick! 1. Sensory Input- Some of our student's need the input from textures and smells to help keep them calm or engaged enough so that they can tap into learning the lesson. This isn't just for our fidgety students but those that really need the additional sensory feedback. 2. Keeps Hands Busy While You Collect Data from Other Student's in the Group- That is right! It gives you a minute to collect the data from one student without three others staring you down or feeling like they are not getting time to independently practice. Grab my J Articulation Mash & Mark for free! 3. 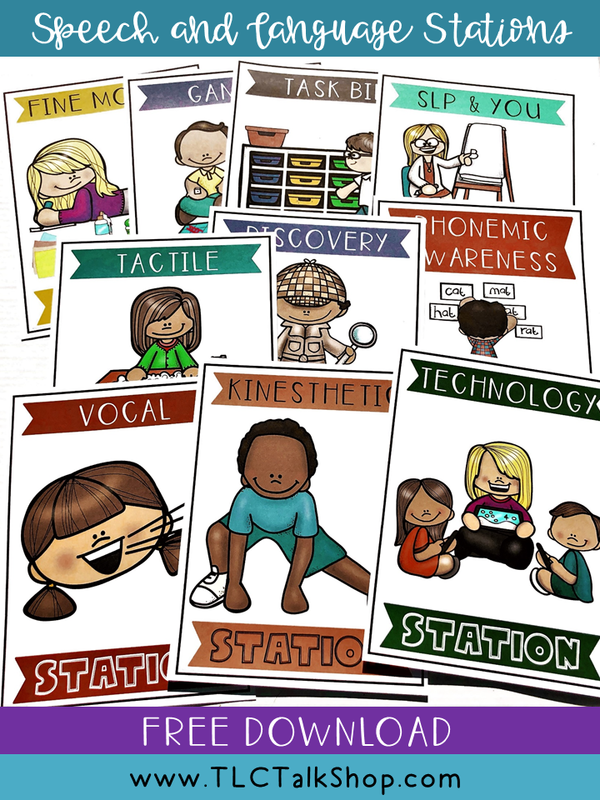 Kinesthetic Learners- In 1983, Gardner introduced the idea of multiple learning styles. One such style are Kinesthetic learning. Kinesthetic learning takes place when an individual is completing a physical activity while learning. Using Play-doh to create a letter while practicing that sound or covering a picture while working on that word would be a beneficial activity for our 'body-smart' learners! 4. Fine Motor Support - Do you collaborate with Occupational Therapists (OT)? 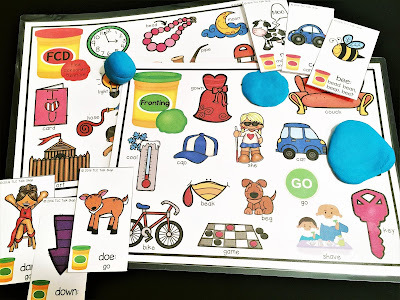 I have worked with several occupational therapists in the past and we have used Mash and Mark sets to work on fine motor skills while practicing speech and language skills too! Working on fine motor skills increases the dexterity and muscle tone needed in hands and fingers (needed for writing and pre-writing skills such as cutting and holding a pencil). Another way to use Play-doh as a collaborative effort with the OT is to place little figurines in balls of Play-doh so that student's have to dig it out. 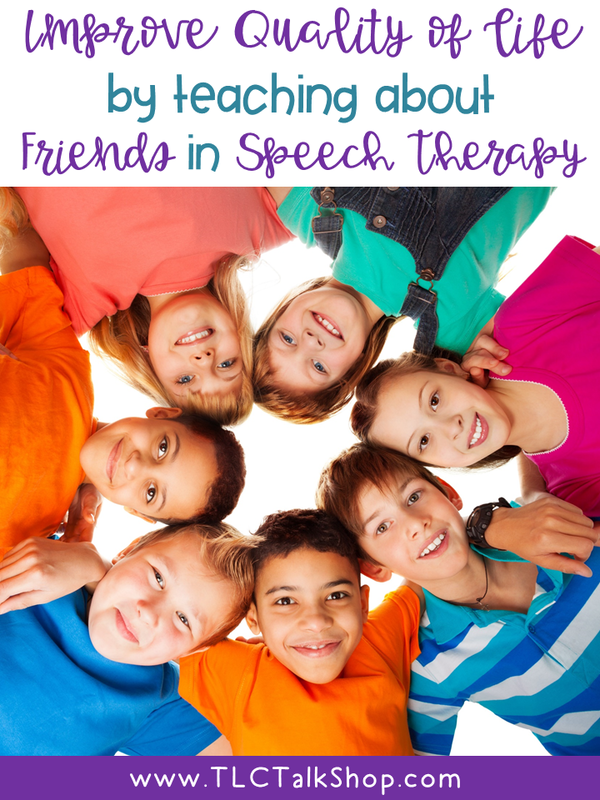 Once they do, they practice their speech skill (or language skill) at their level. 5. Can Help Address Social and Emotional Development- I have found many times that when I get a new little friend, they are sometimes too scared or nervous to start working with someone new. It can be a moment filled with anxiety for little ones who do not spend much time away from their parents. Using Play-doh can help calm them and get them to open up and share their thoughts or feelings about coming to speech. 6. Provides Opportunities to Work on Social Skills- If student's see you pull out the dough and begin to build something, they will usually begin asking questions (i.e. 'What are you building?' 'Can I have some Play-doh too? 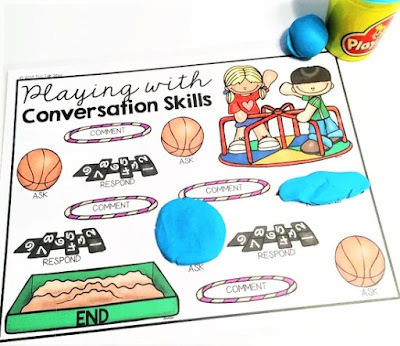 ', etc..) You can even split the Play-doh colors (or the tools such as stamps, dough scissors, etc..) between two or more students and remind them to use their manners and you will often see them begin to play and engage more with each other asking to borrow certain colors or tools or asking what the other is creating. I also use my Map, Mash, and Mark Conversational Sets to work on keeping track of if they asked, answered, or commented to keep conversations going! 7- Turn Any Activity into a Mixed Group Activity- It is true! You may have one student working on language, another with fluency, and the third with articulation. 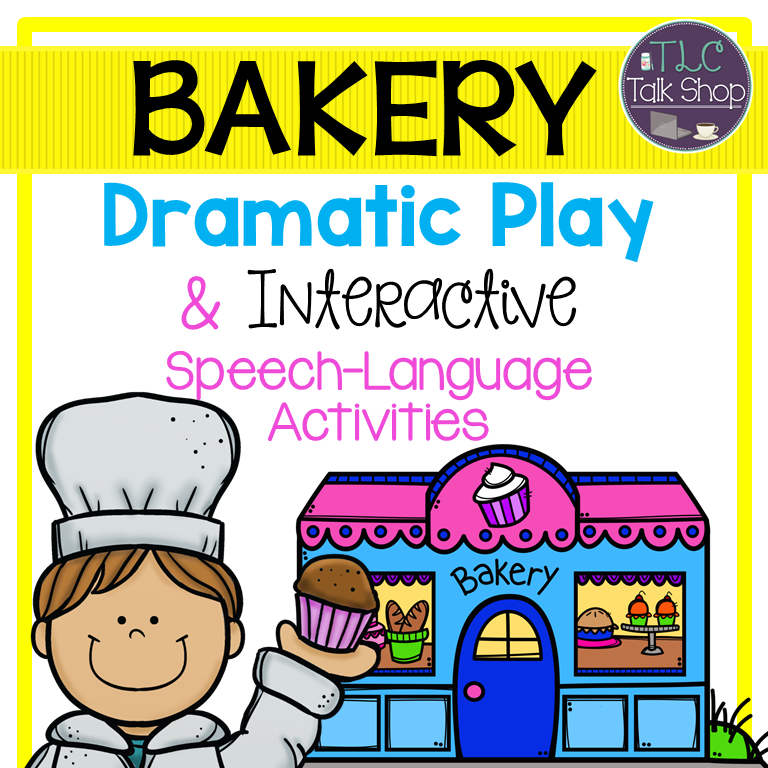 The student with the language goal might create something with their dough (imaginary or real) and then have to provide description, function, or talk about it like they were trying to sell it (or maybe just telling you how to create it). The fluency student could be using their strategy while asking the language student a question about their creation and then demonstrating with the dough if they thought their speech was bumpy or smooth. Or you could have the fluency student practice using their strategies while completing the same task as the language student. What about the student addressing articulation? Simple! 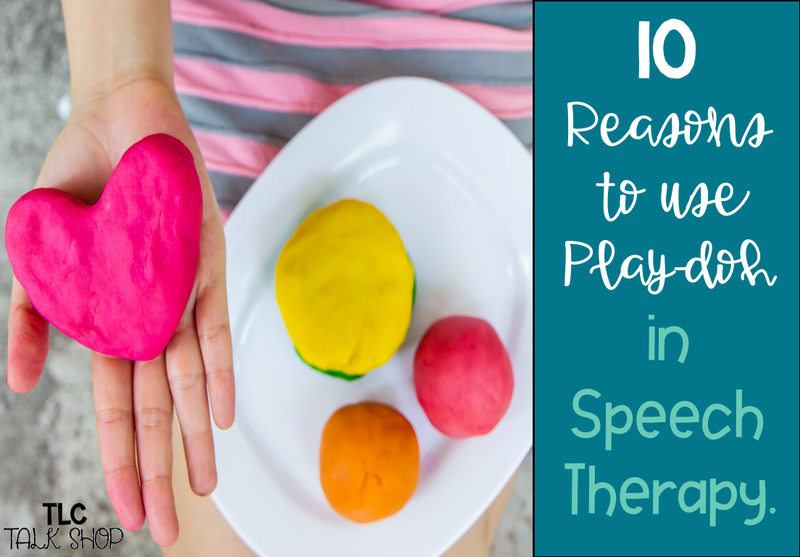 If they are practicing their sound at spontaneous speech level (they could be doing the same task as the language student) or if they are at the word level, they can listen to their peers to see if they use their sound at their position and practice tearing off little pieces of the Play-doh from the ball they had each time they practice saying that word. 8- Visual Supports- I love using dough for visual supports! That might be because I am also a visual learner but I find that it helps so much for my student's too. Visually for an articulation student, they can practice creating the letter while they practice words that contain their sound. Or check out the wonderful blog post by Natalie Snyder about using Play-doh as a visual for /r/ (Link is provided at the bottom of this post). Student's working on Fluency can use the dough to make bumpy vs smooth roads or the straight snake vs the bumpy snake. 9- Great Tool for Learning- You can just about find Mash Mats for any needed goal you need to target with students! Plus, Jennifer Bradley at Speech Therapy Plans has additional excellent ideas of ways that you can use Play-doh as a learning tool! 10- Plus, its Fun! Even as an adult, I enjoy working with Play-doh! Kids have such great imaginations and can create some wonderful creatures, narratives, and/or turn it into is own instant dramatic play session! Who feels like buying a Play-doh Burger and Fries combo? Do you love Play-doh as much as I do? What ways do you use it?